Launched July 24, the official word from Google was that it released "a new algorithm to provide a more useful, relevant and accurate local search results that are tied more closely to traditional web search ranking signals." MozCast initially reported a 60 percent drop in the display of local pack results, but that figure was adjusted to about 25 percent after Whitespark took a closer look at the data using their own methodology. Whitespark also reported they could inspire 7 packs to reappear in SERPs where it was lost by adding the keyword modifiers “Near me” or “Find”, but this is not a 100 percent effective tactic. For now, the update has only rolled in the U.S. The way to rank local listings previously was by building citations, references to a business by name, address, phone number and website URL (NAP+W). It’s important to note that the listing did not have to link back to your website, but certain citation sources did carry more weight than others. It seems as though Google has started to reward local listings to those attached to strong domains. They still use citation signals, but it’s clear the strength of your website plays more of a role in your ability to rank for local queries. Search Engine Land reported the same thing happened to Expedia.This tactic used to work back in 2012, but Google had closed the loophole. After this update, however, it appears to be working again. The strength of the domains caused Google’s algorithm to place the listing in the 7 pack. These results are not likely to remain much longer if Google plan on resolving this. Let the countdown begin – there are only six weeks until SMX East. Internet marketers will descend on New York City Sept. 30 through Oct. 2 to learn the latest strategies in SEO, SEM and SMM from industry leaders, including Bruce Clay. Clay will also lead his acclaimed one-day SEO Training Workshop on Sept. 29. The SEO Training Workshop, based on Clay's record 18 years of experience, focuses on the tenets of successful, ethical SEO and addresses the constant changes and updates to the algorithm – meaning the SEO Training Workshop is never the same workshop twice. 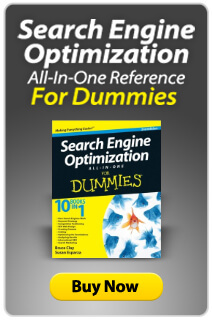 All SEO Training Workshop attendees receive a copy of Clay's book, "Search Engine Optimization All-in-One for Dummies," as well as a three-month subscription to the SEOToolSet® with login access for two domains. If you're ready to register, don't hesitate; early bird rates expire on August 29. With the SMX early bird rate you'll save $200 of your all-access pass.You can also save an additional 10 percent when you use the Bruce Clay discount code: SMX14BRUCECLAY. Former Google engineer Mikey Dickerson was hired by the White House, where he will lead the new U.S. Digital Service. HubPages has acquired Squidoo, a social content platform founded by Seth Godin. Cortana, Microsoft's version of Siri, underwent a range of improvements and upgrades. Microsoft also announced Cortana will be released to users in China and the United Kingdom. Yahoo's market share fell below 10 percent in a record low for the search engine. On Sept. 25 and 26, the Digital Marketing Innovation Summit heads to San Francisco. The ASCEND Digital Marketing Summit will be Oct. 22–24 in Philadelphia, Pennsylvania. SMX East takes place in New York City Sept. 30 to Oct. 2. Bruce Clay is an official training partner of SMX East and will offer his 5-star rated SEO Training Workshop on Sept. 9. Save 10% on your SMX Advanced registration with the Bruce Clay discount code: SMX14BRUCECLAY. The Content Marketing Institute's Content Marketing World, billed as the largest content marketing event in the world, happens Sept. 8–11 in Cleveland, Ohio. The four-day Inbound 2014 conference will be in Boston next month, Sept. 15–18. Marketing Land launched a section called Holiday Retailer with an accompanying Retail Column, aggregating news, opinion and guides for online marketers in the retail sector. No, it's not Christmas in July; it's just that planning for well-executed holiday marketing campaigns starts now. Facebook intiated a pilot program to provide free Wi-Fi for students in Forest City, NC. Google introduced dynamic sitelinks, which will automatically generate on PPC ads. Best of all, the clicks on dynamic sitelinks are free. As the name suggests, Facebook's latest feature "Save on Facebook" allows users to save articles they encounter in the feed. The saved items are private and allow users to go back later to view these articles. Google+ debuted the Showcase App for Google Hangouts. With the Showcase App, broadcasters can direct viewers to their website, YouTube videos, Google+ profiles and more via a prominent vertical bar appearing alongside the Hangout. Penguin 3 could launch any day now, but when? Webmaster Trends Analyst John Mueller admits it's been quite a while since the last penguin update but assures us that engineers are working on it and imagines it won't be long until it launches. Google redefined how search ads are triggered with close variant keyword matching for all exact and phrase matches, reducing the complexities of account management at the expense of a lower ROI. Facebook's emotion experiment turned out to be much more after it was reported that Facebook partnered with Nielsen to send the TV ratings company viewer information of Facebook users watching TV shows from a mobile device. Google's new "Pigeon" algorithm update for local search places more weight on traditional web ranking signals to provide more relevant and accurate local search results. Google is testing out a dynamic timeline view of knowledge graphfeaturing facts and data related to your search query that drills down into other timeline views of information with every click of a data element shown within the knowledge graph. Bing Ads updated its user interface to closely match that of AdWords in an effort to make campaign management between the two platforms as seamless as possible. Bing introduced its own conversational search. When you ask Bing a question, such as "Who played Morpheus in The Matrix?," Bing will give you a direct result (Laurence Fishburne). Users don't have to click through to a website to get answers for certain queries, like this one. Drinks on us! We're sponsoring the SMX East Meet & Greet on Sept. 29 at the Sheraton New York Times Square from 6:00-7:30 pm. It's after Bruce's SEO Workshop and open to all attendees of SMX East. ©1996 to 2014 Bruce Clay, Inc. All rights reserved.